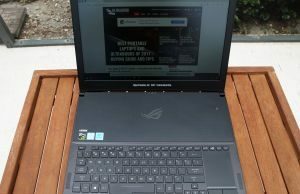 Summary: The Asus Zephyrus is unique at the time of this post, as the only thin and light 15-inch laptop with a GTX 1080 in it. It has some flaws, most of them inherent to a computer with this kind of form-factor and some caused by the choices Asus made, but overall this gets a good grade because I think it has good value, decent build quality and some pretty good features. Not only does it have a lot of horsepower, it also works well in all sorts of loads and carries a nice 120Hz IPS screen with GSync. I think those factors alone make up for the shortcomings, but read on for the whole story below. If you were paying attention during Computex, you might have had your eye caught by Asus with the ROG GX501 Zephyrus. 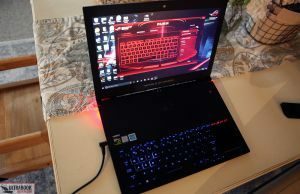 It certainly caught my eye, along with the Acer Triton and the Aorus x5, by being the only thin, 15” laptops with a GTX 1080 inside. 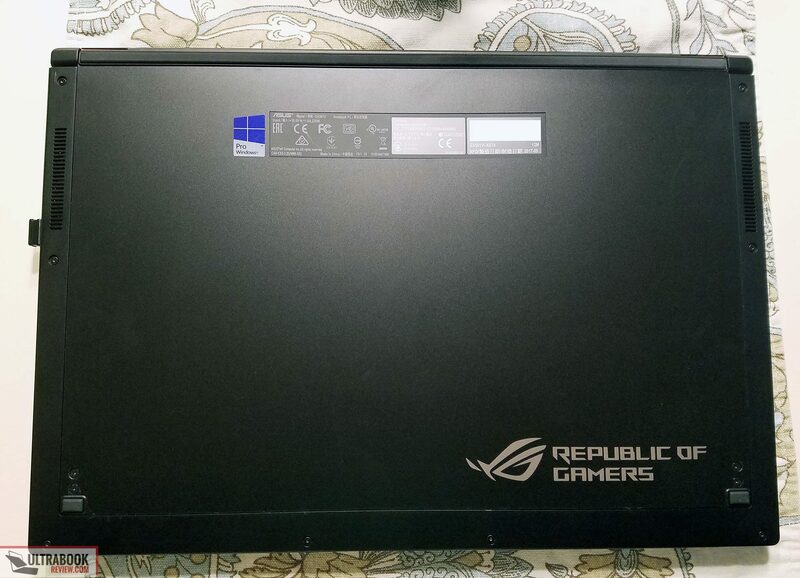 I honestly didn’t know if Asus had it in them to make a thin gaming laptop again. After the flop with the GX500 a few years ago (which ended up being vaporware and eventually turned into the G501), I assumed they had just given up going the thin route. But from what it looks like, the Zephyrus looks to be worth the wait. 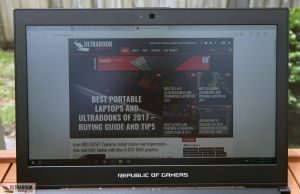 The main catch with putting a 1080 in such a thin laptop is the Nvidia “Max-Q” specifications. In a nutshell, the TDP of the GTX 1080 chip is lower to reduce the heat generated, but it comes at a cost of slightly decreased performance. This is very similar to what Razer did with the Razer Blade Pro, only the Max-Q spec didn’t exist then when they released it. 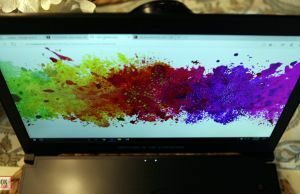 But if you read my review, you’d know I wasn’t thrilled with the Razer Blade Pro at all. It wasn’t because of the throttled GPU as much as it was the throttling overclocked CPU, annoying keyboard and the hefty price tag. On paper though, the Asus Zephyrus appears to be a smaller, lighter and cheaper version of the Razer Blade Pro – something I just had to see. 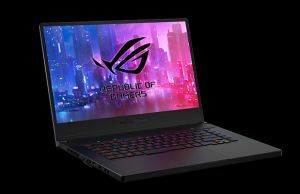 Update: Our review of the updated ROG Zephyrus S GX531GX with RTX 2080 max-Q graphics is available over here. Needless to say, I had a lot of questions that needed answers. Questions such as how’s the battery life? Is that moving part going to be a problem? And if there really are four SSD slots? Hopefully, this article will answer most of your questions as well. Note that this is an early review starting July 2nd and I might be missing some details. I’ll be posting updates over the next couple weeks and will keep a mini update log below. Let’s get started. 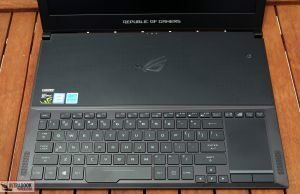 Asus also offers two other Zephyrus models, the Zephyrus M with a standard keyboard arrangement and a slightly larger footprint, or a more compact Zephyrus S series, both with updated hardware and 144 Hz IPS screens. 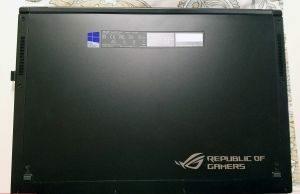 The Asus Zephyrus GX501 has a very unique design. Most of the design is driven by a single customer need: putting a GTX 1080 in a thin, 15” laptop. Because of that, there are many sacrifices and clever design choices that needed to be made. Whether or not these sacrifices are tolerable or not is completely up to you. So, let’s go over everything in detail. First off, if you’re planning on this being a professional looking laptop, think again. 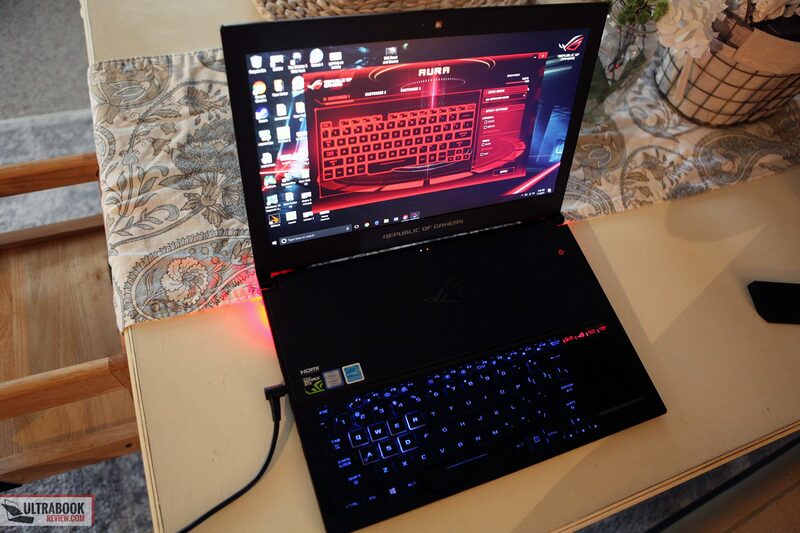 This laptop says gamer all over it. And that’s not a metaphor – it literally says gamer in three different spots. On top of that, the glowing red logo and the red lights underneath pretty much scream for attention. The laptop as a whole is very light and well balanced. It’s pretty much symmetric and very easy to carry, while closed. Weighing just under 5 lbs, picking it up with one hand is not a problem. The build quality feels pretty sturdy and like it would last a long time – while closed that is. Opening the lid shows off one of the unique features though. There are two legs that retract when you open the lid, which in turn opens the back end of the bottom panel. This opens a direct pathway to the two fans, most likely the intakes. It’s an interesting concept that prevents blocking the bottom intake vents with your legs, like in most other laptops. The only issue I have with this is the panel that retracts is plastic and feels a little flimsy. When merely using it on your lap, you’ll probably never notice. But when you have to lift your laptop one handed, while the lid is open you’ll definitely feel the plastic flex. Of course you could grab it from the front, but that’s where the keyboard is. I worry about breaking this over time, but there’s really no way for me to tell how durable it will be. Hopefully Asus has replacements on standby. Moving on to the details of the design, let’s start from the top. The lid is made of brushed aluminum, dark grey in color. The brush strokes are in two directions and are separated by a diagonal. It looks like there’s a bump on the angle, but it’s purely decorative. 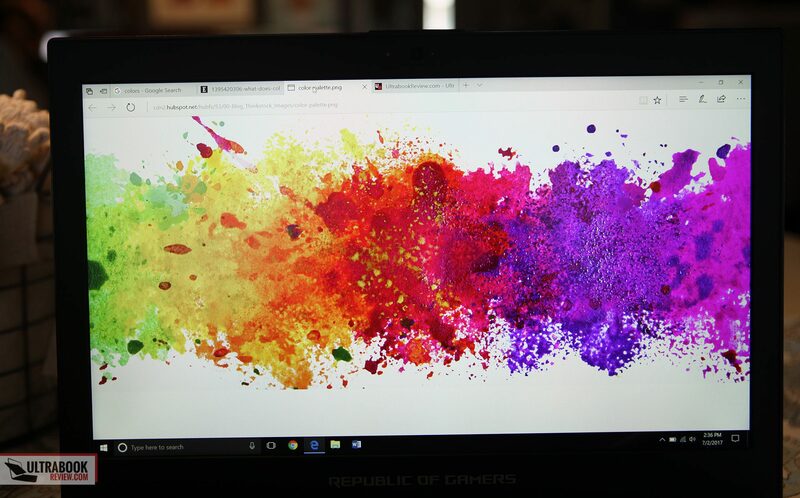 The Republic of Gamers logo is large and takes up a lot of space, which also glows a red color proportional to the screen brightness. The red is not that bright, at least, and is only really noticeable in a dark room. Along the bottom is some small text saying “Republic of Gamers”. The brushed aluminum is nice looking, but it should be known that it’s a fingerprint magnet. In the first couple days alone, I had to do an extensive wipe job to get the prints to come off for some pictures. 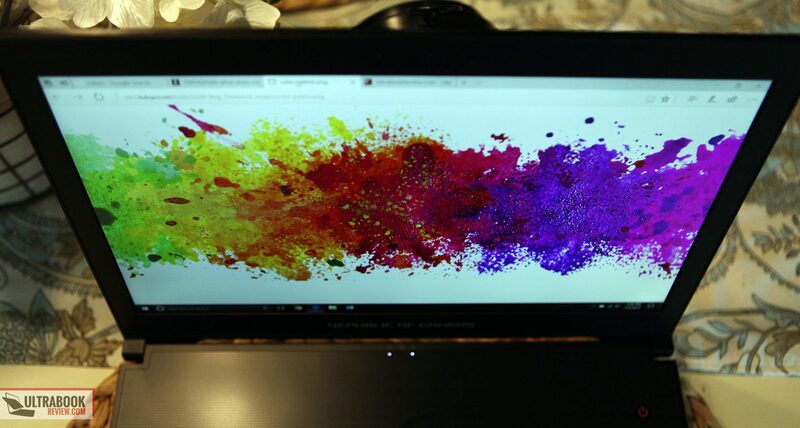 This is pretty normal for dark colored, metallic laptops, but for some reason this one seems worse than others. Lifting the lid is a one finger operation. 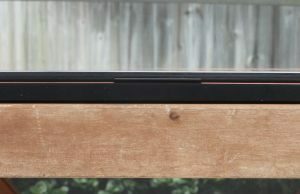 The hinge is pretty sturdy and holds the screen well, but it has its limitations. It only opens to 120 degrees before it hits a hard stop with the foot mechanism. While adequate for most, I personally would prefer to have at least 135 degrees. Underneath the lid is the 15.6” matte FHD panel. More on the screen later, but the panel is surrounded by a plastic bezel. The side bezels are thin enough but the top and bottom are relatively thick. At the top are your microphone, ambient light sensor, and the HD webcam. On the bottom is another “Republic of Gamers” text, this one being much bigger in size. 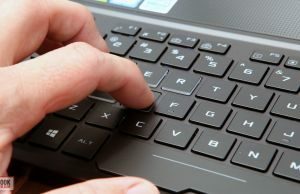 The keyboard is the one part of the laptop that certainly grabs attention. I’ll discuss the keyboard and trackpad in more detail later, but for now, let’s just note their location – at the front edge of the laptop. This is undoubtedly to make room for proper cooling of the GTX 1080 in a .7” thick laptop. Above the keyboard is a solid black panel with a bunch of tiny vent holes, likely intake. 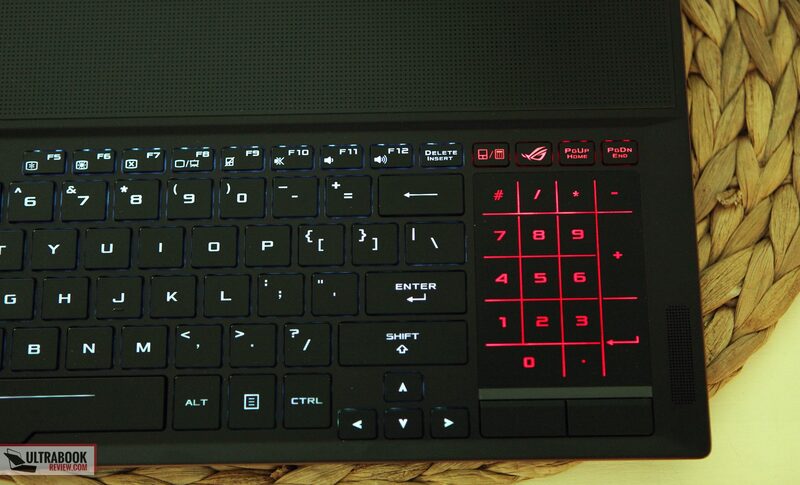 There’s an embossed ROG logo centered in the space and a power button off to the upper right. That button glows red, by the way. Centered at the top are three indicator lights: SSD activity, power, and battery. Two small speaker grilles are located on the right and left corners of the keyboard. Finally, just above the keyboard are a bunch of stickers that can be removed. On the right edge, there are two USB 3.1 type A ports, along with a USB 3.1 Type C port, which also supports Thunderbolt 3. I was able to verify that the Thunderbolt port is indeed x4. Towards the back edge is a Kensington lock. On the left side, there is another pair of USB 3.1 Type-A ports. In front of those is a mic/earphone combo 3.5 mm jack. There’s also the power connection and an HDMI 2.0 port as well. Towards the rear is an intake vent. 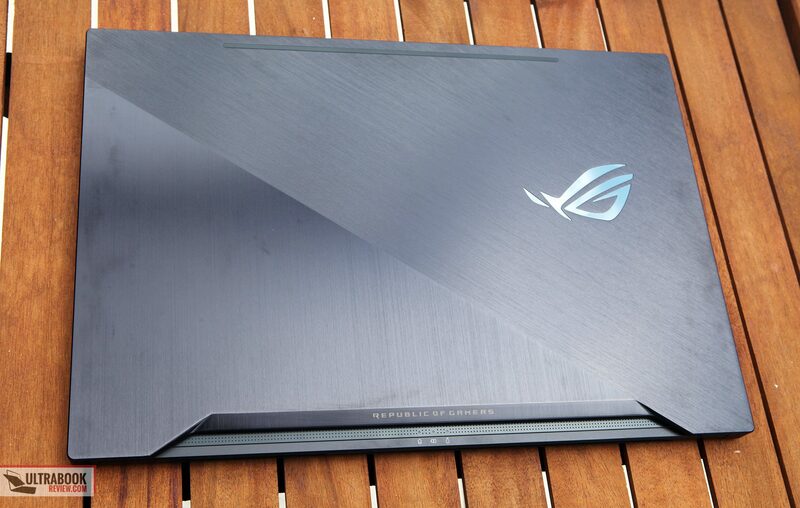 The front edge is pretty plain, with only the Asus logo on the left-hand side. The rear has a cool look to it, with a copper-colored exhaust vent and the small Zephyrus text in the center. 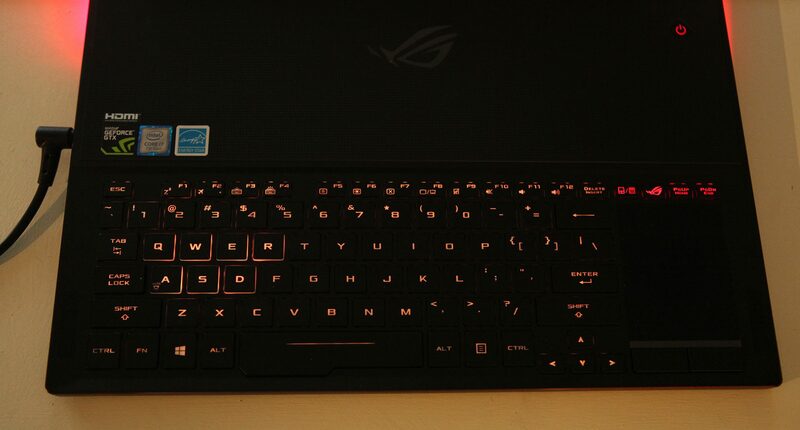 That same copper color is used to accent the top edge of the keyboard area. The bottom panel is one of the few areas made of plastic. As discussed before, when the lid is open, part of the lid pushes outward, opening up access to the intake/exhaust vents. There are also more vents on the edges. Other than that, there’s not much else on the bottom beside some regulatory information and a very large “Republic of Gamers” logo. There are a couple of things that annoy me with the lift mechanism on the bottom. First is that the power cord is just big enough to get caught in the gap. So when you close the lid to put the laptop away, the cord gets caught. It’s happened to me three times already and I expect it to happen more considering I swing my power cord behind and to the right of the laptop, often. The other thing to note on the bottom panel is the red lighting. There are two VERY bright LEDs that glow when the unit is plugged in. As far as I can tell, there’s no way to turn this off. Some people may like this sort of thing, but I don’t really care for it at all, as I find the lights distracting. My overall impression of the design is pretty good, but I do worry about that moving panel on the bottom. It would have been nice for it to have been metal, but I certainly understand not wanting to have sharp edges being exposed. I just hope it lasts. As far as the rest of the design Is concerned, it’s certainly well built. I just wish they’d relax on some of the flashy gamer stuff. I think the pictures can speak for themselves that the keyboard on this machine is a little…different. 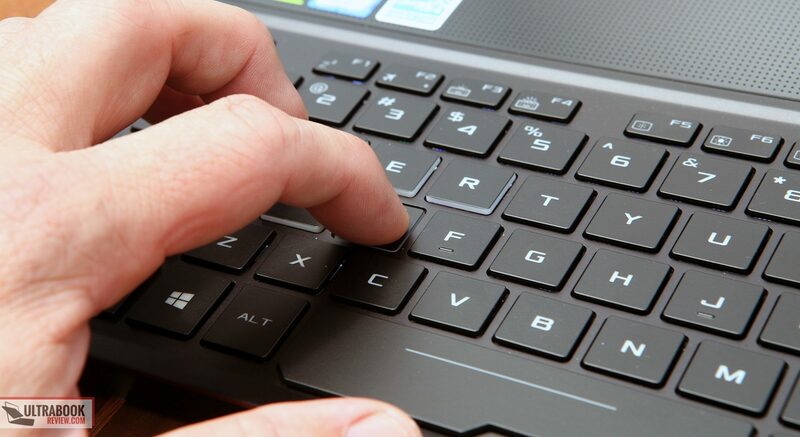 Instead of being in the usual spot, the keyboard is at the front edge of the palm rest. No doubt this was done to make more room for proper cooling of the internals in such a thin design. I’m still getting used to it, but I can’t say this is bad just yet. It’s a little weird typing with the laptop on my lap, mainly because my arms and hands are in an unfamiliar position. I couldn’t exactly move the laptop further forward to compensate because then it would be halfway off my lap. 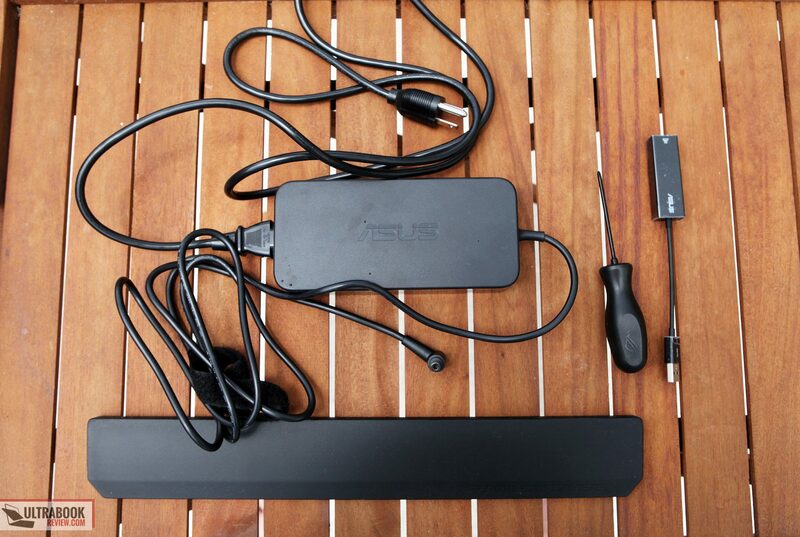 One nice gesture Asus made is providing a palmrest in the box. It’s not really practical for the lap, but it’s nice if you plan on typing on a desk. I took my typical typing test and scored 50 wpm with only 2 errors, while the laptop was on my lap. 50-55 is typical for me, so I was pretty surprised I was able to type so well considering it feels so awkward. I also retook the typing test on a desk, with the palm rest. That time I scored 53 wpm with 1 mistake. I also took the time to measure the actuation force of the keys, which ended up being 65 grams. While that is pretty good, the feedback felt a little mushy to me so I measured the force before the key returned to normal position and only got 30g. Finally, the keystroke length was measured to be only 1.3 mm. The keyboard is backlit, defaulting to red when you start it up for the first time. 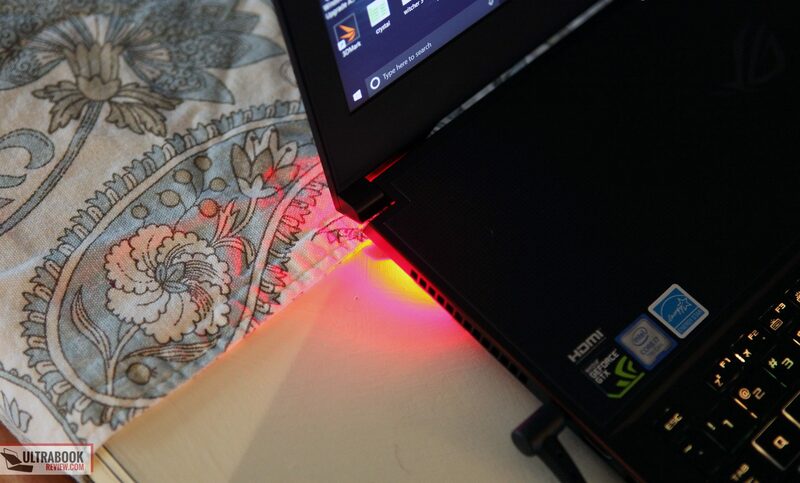 There is software on board that allows you to change the backlighting colors, if you desire. Most of them look pretty good, but white is a little off for my taste. The brightness level can be controlled by a software slider or by a function keyboard shortcut. Note that the keys above the trackpad are stuck being red, for some reason. The WASD and QWER keys are zone controlled and can also have different colors if you desire. 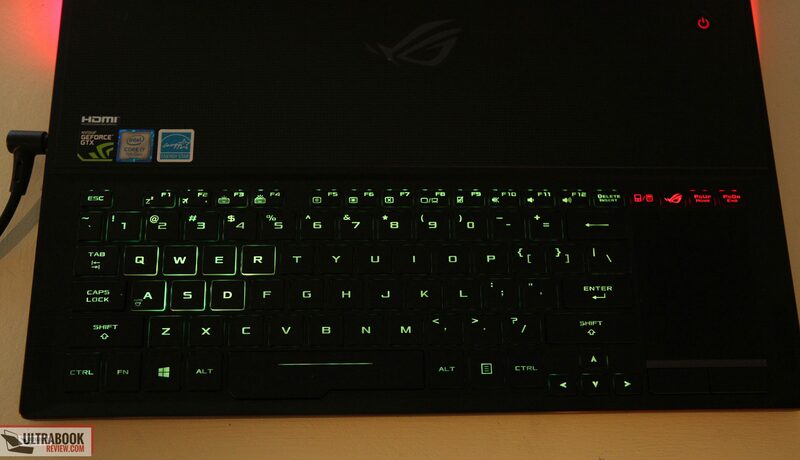 You might notice that these keys also have some extra highlight with the backlighting. Honestly, I wish they’d stop doing this, especially considering you can now change the color. It would be nice to have the option for all the keys to look alike. In the end, it’s a decent typing experience for me, but I think there will be a number of people out there that won’t like the keyboard at all. A little more feedback from the keys would certainly help, but I think the forward keyboard location will be more of the deal breaker. And then there’s the keyboard layout. You’ll notice that there’s also no Numpad, as there’s a trackpad in its place. But the Numpad isn’t totally gone. In fact, if you hit the key above the trackpad (probably where PrintScreen should have gone), it’ll illuminate the trackpad to look and function like a Numpad. It actually works pretty well, but it takes a lot of practice to get used to. The biggest drawback is it disables the trackpad, so if you need to navigate to the field you need to use the NumPad with, you need to navigate there before you activate the NumPad. And after that, you’ll need to rely on the keyboard to get to the fields you want to go to, else rely heavily on activating and deactivating the Numpad constantly. Honestly, I can only see myself using this feature when using a regular mouse. So about that trackpad? It’s actually pretty nice, considering it’s ridiculously small. But that’s just it – it’s ridiculously small! Not height wise – it’s just really, really narrow. Seeing the size of it from pictures at Computex, I expected the worst. But after using it for a while, I’m pleasantly surprised at how well it tracks and registers multi-touch gestures. It’s not a click pad, so you’ll need to rely on single and double taps for your clicking needs. Yes, there are two big buttons at the bottom, but I found these buttons to be very awkward to use. It’s a combination of the trackpad location and the shape of it, but my fingers are almost never near those buttons, so I rarely used them except for drag and drops. And that’s basically the weakness with such a narrow trackpad – drag and drops can be a little frustrating. A number of times I found myself running out of space and dragging my finger off the side. This is one of those things that I’ll get used to, but it’s going to take time. 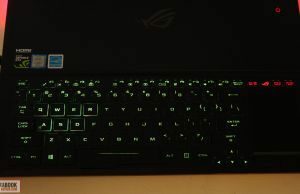 I was a little critical of Razer for replacing the Numpad with a trackpad, but I’m going to give Asus a pass on this one. Mainly because there isn’t anywhere else to put it (except maybe above the keyboard like Acer). 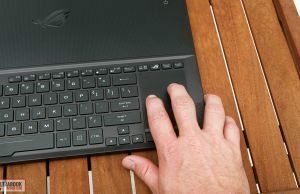 At least Asus found a way to integrate the trackpad because Razer just flat out removed it. But I also actually like the location of the trackpad better than Razer’s because of how close to the edge it is. I find that by resting the edge of my palm on the front corner of the laptop, I was able to naturally use the trackpad with ease and comfort. Left-handed folks are going to hate the trackpad’s location though. The only screen option for the Zephyrus is a 15.6” 1920 x 1080 px IPS panel. It’s matte and non-touch. In case you’re losing interest though, the good news is this is a 120Hz panel. This was a surprised because it is the first time I’ve seen a 120Hz IPS panel in a laptop. And boy is it a nice perk to have! Like most IPS panels, the viewing angles are really great. The contrast ratio is also very good, measuring 730:1. The peak brightness was measured to be 261 nits while the blacks at that level were .36 nits. At the lowest brightness settings, the whites go as low as 30 nits so night time use is pretty decent. Unfortunately, the maximum brightness isn’t all that high and it makes it slightly difficult to see the screen outdoors, even though there’s a matte coating on the screen. It’s more than adequate for indoor use though. Color reproduction is very good. Asus promises a 100% sRGB screen, but this one falls a little short. Using my Spyder4Pro, I measured color spaces of 93% sRGB, 69% NTSC, and 72% aRGB. Still respectable and most people won’t be able to tell the difference, I’m sure. 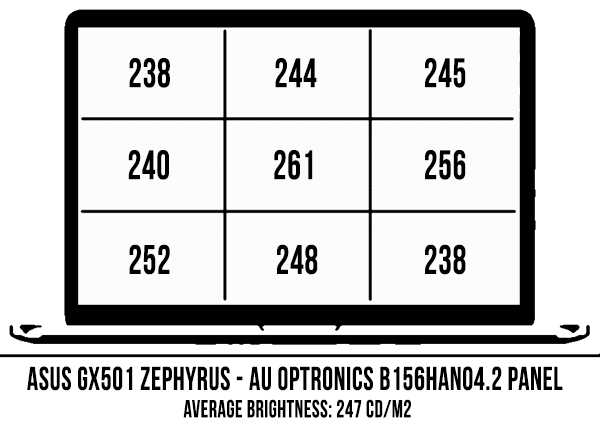 In case you wanted to look up the specs yourself, this panel is made by AUO with the model number B156HAN04.2. The hardware ID is also AUO42ED. Like I mentioned before, the screen is 120Hz, which should prove beneficial to make your gaming experience look extra smooth. Competitive gamers may find this falls short, though, mainly because it’s IPS. 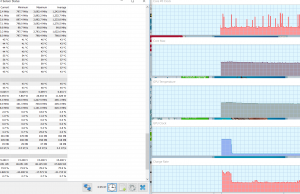 Unlike a TN panel, the response time is most likely in the 20ms range as opposed to 1-5ms. Probably the only complaint I have with the screen was the amount of backlight bleed on my unit. It’s not the worst I’ve seen, but it’s pretty close and kind of unacceptable for such an expensive laptop, in my opinion. This is the nature of IPS screens though and your mileage may vary. Overall, this is a great screen though. I can overlook the backlight bleed because it’s not noticeable at all unless the screen is black. Other than that, there are plenty of positives and I’m quite pleased with what I see. This Asus Zephyrus comes with a single configuration: a Kaby Lake i7-7700HQ CPU paired with an Nvidia GTX 1080. From what I understand, there’s supposed to be a 1070 version coming soon. 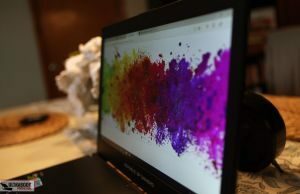 The i7-7700HQ is a powerful quad-core CPU and is pretty much the best thing you’re going to be able to fit in such a thin laptop. Sure they could have gone with the overclockable i7-7820HK CPU, but all it would have done was add cost and likely suffer from thermal issues. The GTX 1080, on the other hand, is not something you typically see in thin laptops. 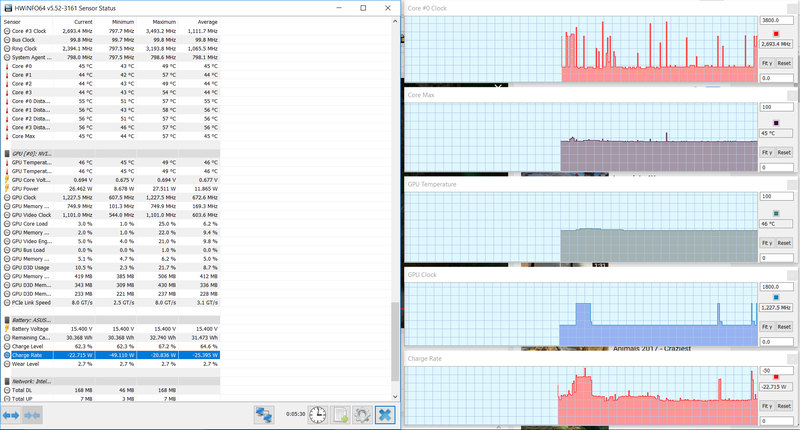 And if it were a fully powered GPU, such as the desktop variant, it would certainly suffer from thermal throttling. But this particular GTX 1080 is tuned to follow Nvidia’s Max-Q standard, which allows it to run at a significantly lower TDP in order to run cooler. Less heat means smaller fans and thinner chassis. Another benefit to the Max-Q design is the power brick. Because of the lower TDP, the size of the power brick is down to 230W, and is relatively portable compared to the other GTX 1080 laptops out there. I’d much rather travel with this power supply than the one I saw on the Alienware 17 r4. Of course, the CPU and GPU are both soldered onto the motherboard, so future upgrades in those areas is impossible. 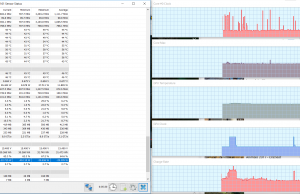 There is 16 GB of RAM on my configuration, with the ability to upgrade to up to 24 GB of RAM. 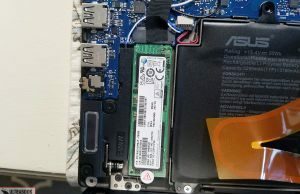 The reason for only 24 GB is because 8 GB of RAM is soldered onto the motherboard and the single slot is occupied by an 8GB module in this case, but replacing it with a 16 GB one will give you the max 24 GB allowable. 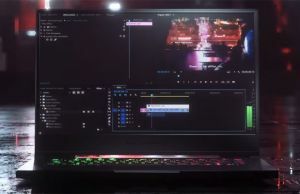 This laptop has Gsync enabled, so you’ll be able to enjoy smoother gaming performance, as well as being able to leave Vsync disabled and have no screen tearing. Of course, having Gsync means no Optimus, so power savings with an iGPU are non-existent. The laptop comes Gsync enabled by default, but can be disabled in Nvidia’s settings. All of my benchmark testings was conducted with it disabled but the gaming was done with it being on. So as far as the performance is concerned, this laptop can pretty much handle anything you throw at it. If you’re thinking of using this as a desktop replacement, I can say with confidence that this laptop should perform very well with most, if not all your needs. As far as gaming is concerned, it will definitely perform well, although it falls a little short of a desktop i7 paired with a desktop GTX 1080. Still, considering the small form factor, no complaints here. As far as the storage options, this model comes with a 512 GB PCI-e M.2 module. 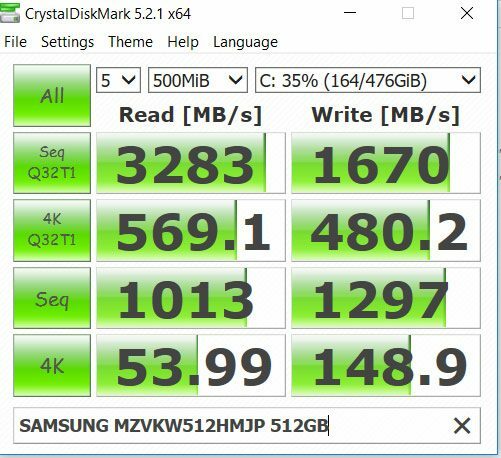 It’s a Samsung SM961 model, so Asus didn’t cheap out on the SSD storage. 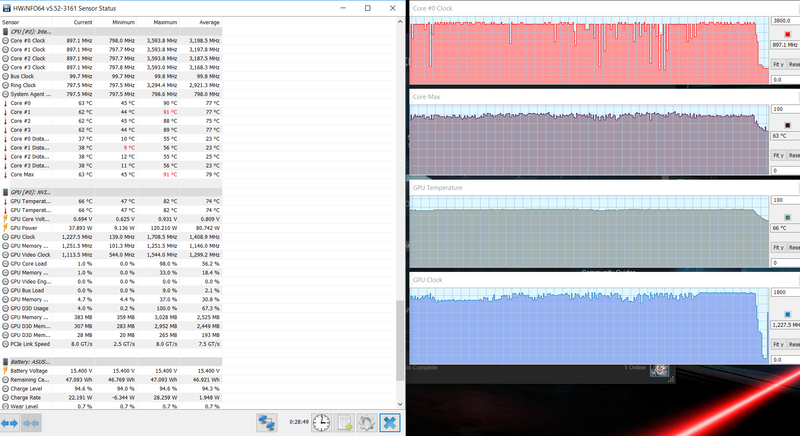 It’s no slouch either, as you can see from my CrystalDisk benchmark. If you want to upgrade the storage in the future, you can. By the way, if you want to perform these upgrades, you have your work cut out for you. I’ve seen worse, but this one is a little tricky. First, you need to remove the four Phillips screws on the back. Good thing Asus provides a Phillips screwdriver in the box, right? Next, to remove the cover, you need to open the lid so the legs push it outward. Then the cover slides off. Side note: Asus actually includes directions on how to do this. Their intent is to give you a way to clean your fans without breaking your system – hence the free screwdriver. 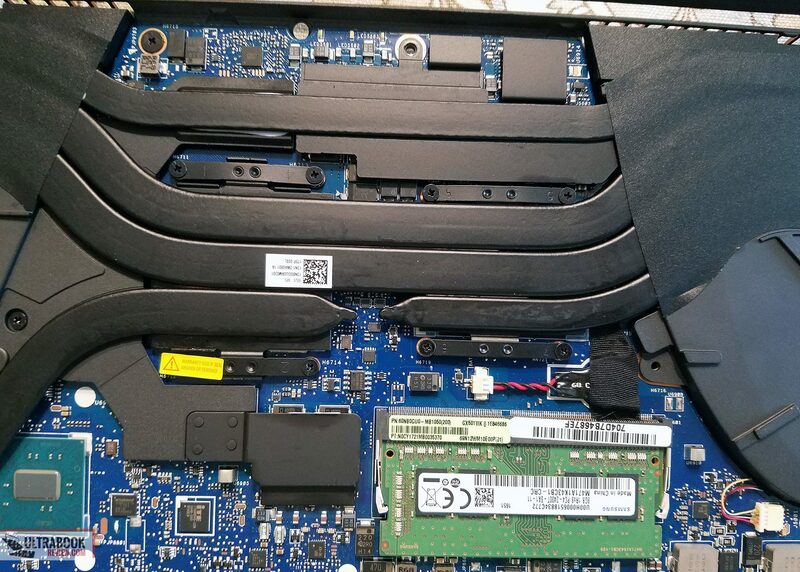 Next, you’ll need a T5 Torx screwdriver (Asus didn’t include that one). Remove all the screws on the back to release the top cover. 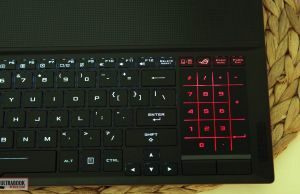 Then you need to open the laptop lid again and push the keyboard cover upward, starting at the Zephyrus text/indicator light area. I used a plastic opening tool to push it up, but a credit card would also probably work. Once you get that edge, the rest comes up nicely. Don’t pull too hard though because there are ribbon cables attached to the keyboard cover. Underneath is a work of beauty. 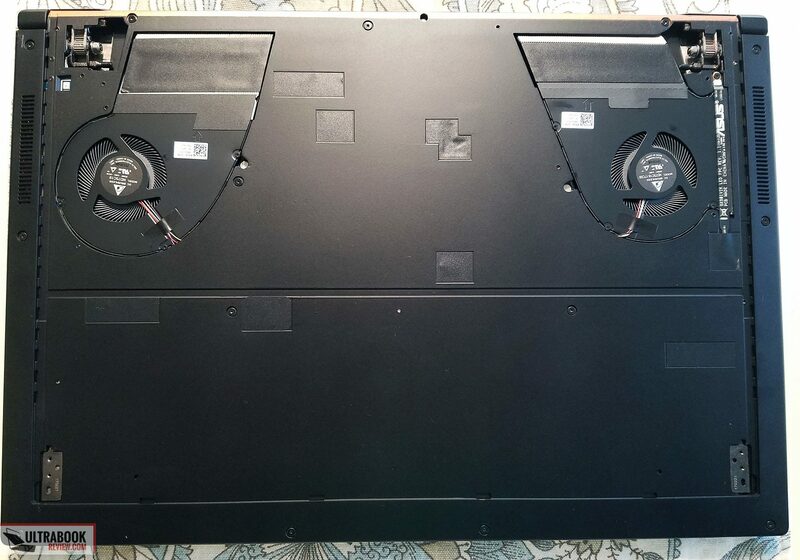 It’s clear why the keyboard got pushed downward, because these fans are very thick for a .7” chassis. As you can see, there’s only one RAM slot but there’s also only one M.2 slot, in the corner. I was really disappointed to see this because I remember reading multiple previews from Computex stating that there were four M.2 slots. As you can clearly see, the Max-Q GTX 1080 is more than enough to handle even the most demanding games at FHD 120Hz. What will push this to the limit, though would be to hook it up to a QHD or 4K monitor, but in this case you can also buff it up with external graphics hooked up through Thunderbolt 3. One quick thing to mention for those that wish to game on battery: you might want to look somewhere else. I’m spoiling the battery life section, but not only is the battery life pretty sad(about 1 hour), there’s an fps limit of 30 fps. There might be a way around this limit, but it’ll kill your battery life even further. Because of the Max-Q design though, performance isn’t like a full GTX 1080. 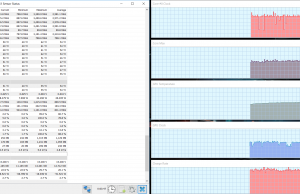 Nvidia claims performance should be at least 90% of the desktop cards and my numbers match up. This is still better than a GTX 1070, so there is some value to having the Max-Q 1080, even though it’s a little slower than a fully powered card. Still, I’m pretty happy with the results I’m seeing. 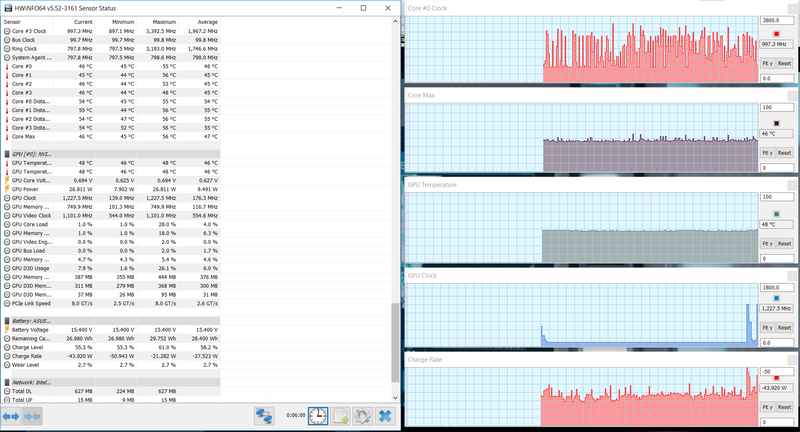 The heat is a little troublesome on the CPU side, but that can be fixed with a slight undervolt. 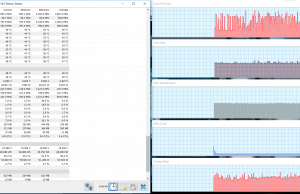 With a simple -100mV undervolt, I was able to improve my CPU temperatures by 6-8C in benchmarks and gaming sessions. The GPU is far under the thermal limits in all my testing, so no worries there. There is some room for overclocking the GPU as well. 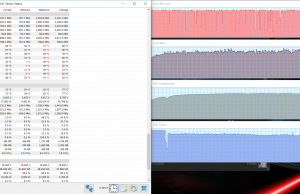 I was able to overclock the GPU and RAM by 225Mhz, using MSI Afterburner, and so far so good as far as stability is concerned. My Firestrike score increased to a combined score of 15204 with the graphics score going up to 20362. I also reran the Witcher 3 at the default Ultra 1080p settings – my framerates increased to 74-86fps. GPU temps were only a couple degrees higher. Considering the stock Firestrike scores on the Alienware 17, I reviewed the other day, were 15411 with a graphics score of 21690, this is actually pretty impressive. Even my desktop 1080’s graphics score gets a stock score of 21786. That puts the performance close to 94% of the full GTX 1080 card. 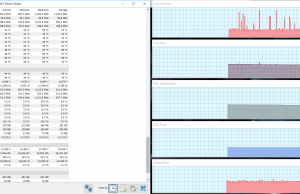 Of course, there’s still the ability to overclock the desktop 1080 even further – so there is a significant difference between a fully OCed Max-Q and desktop cards. But given that these overclock numbers are achievable and without compromising the thermals, this is something that’s worth considering. There is some controversy out there about the Max-Q design. From my point of view, it’s almost as if Nvidia has revived the “mobile” processors that they killed off late last year. Many don’t like that they are marketing and selling a GTX 1080 GPU that acts more like an overclocked GTX 1070. And rightfully so – it’s totally understandable to be annoyed at paying 1080 prices for a card that doesn’t quite perform up to standards. But I personally do see some benefit in using an underpowered 1080 in lieu of an overclocked 1070. The heat produced from an OC 1070 at full TDP is likely going to be higher than the Max-Q 1080. This is likely what allows this thin design to happen in the first place. 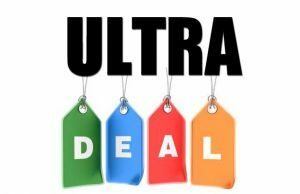 Now if it were possible to put that 1070 in this laptop and achieve the same performance, then I think that should be an option and at a discounted price. But until then, I think I’ll give Max-Q a little leeway and realize that this is merely filling a niche for gamers that desire the thinnest device possible. The cooling system on the Zephyrus is pretty interesting, to say the least. From what I can tell, the intakes come in from the sides and through tiny vent holes on the top. 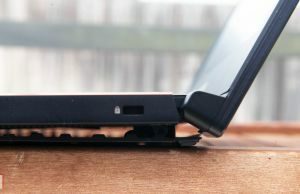 The exhaust is through the back of the laptop – both through the vents and that flimsy panel that swings open when you open the lid. 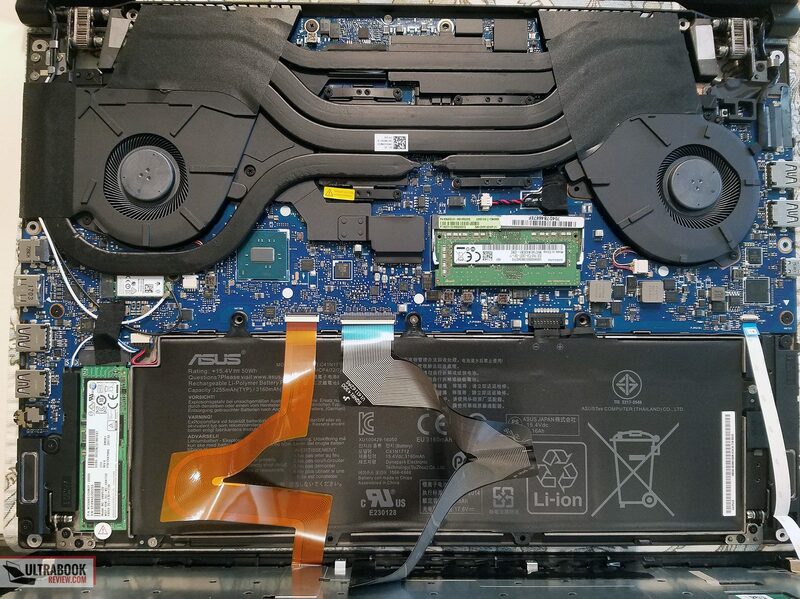 I took some measurements on the top and bottom of the laptop, both during normal use and during a 30-minute gaming session. The results were pretty high, but it actually didn’t feel all that bad gaming on my lap. From what I understand, Max-Q technology is also supposed to include WhisperMode. This is coming soon in a GeForce Experience update. Apparently, activating it will configure game settings to operate so that the fans will be nearly silent. I can’t comment on how well it works, but it should be interesting when it comes out. My guess is it’ll just be a convenience, as you could just modify the game settings yourself to regulate the total GPU usage. Less usage = less heat = less fan noise. 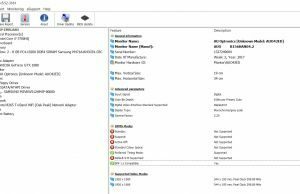 Radios – This laptop comes with an Intel Dual-band AC 8265 module. From my experience, this is a great module and carries a perfectly stable connection at all times. Indoors, I maxed out my connection in most parts of my house (90Mbps). Outdoors, roughly 50 feet away from my router and between 2 walls, I achieved a 67Mbps connection. Not bad at all. Bluetooth 4.1 is also bundled in the module. What’s not included is an Ethernet port. But Asus does include a USB to Ethernet dongle to get the job done if need be. I plan on updating this portion later when I test to see how fast the ethernet is. Speakers – There’s really nothing special about these speakers. They’re pretty small and lack bass. Playing my typical test song, I was only able to get the amplitude up to 65dB. Bass was only registered at frequencies as low as 80 Hz. At least the speakers are upward facing, so the sound wasn’t muffled or anything. At max volume, with high pitched noises, I noticed some distortion though – especially with the Windows notification sounds. More troubling is with the left speaker, which is almost always covered with my left hand when I’m using the keyboard. Bottom point: you’ll be wanting to use headphones while gaming. 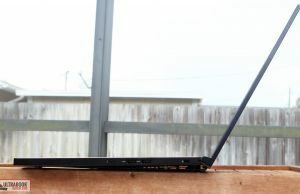 Webcam – A standard HD webcam is included, centered on top of the screen. It’s nothing special but takes pretty decent video in low light conditions. The quality greatly improves in a well-lit room. I’ve seen better cameras, but I’ve definitely seen a lot worse as well. It’s good enough for my needs. The configuration I received has a 50 Whr battery. There’s not a lot of space in this laptop, so that’s about as big as it can get. This was probably my biggest concern when researching the laptop beforehand, and rightfully so. 53 W (~ 1h 8m of use) – gaming, Witcher 3 1080p High – 30 Fps limit. The main culprit for the low battery life is Gsync. Because it’s enabled, there is no power saving from using Intel’s iGPU. So the GTX 1080 is on all the time, and even though it’s probably throttled to low frequencies, it still is using more power than an Intel iGPU. This is just me – but for laptops such as these, I wish the manufacturer would throw a switch or give another model with Optimus enabled. I think there’s a big enough audience on this one where a reasonable crowd would prefer one over the other. The battery life is going to be a real deal breaker for some people. 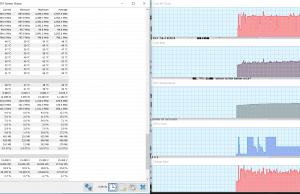 For a laptop, <2 hours of practical usage is not ideal. As long as you carry your charger around at all times, it’s probably no big deal. 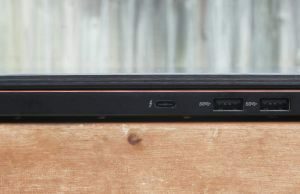 But for those that want to use this in place on a traditional ultrabook, you might want to look elsewhere. The model I received has a list price of $2699 and is available at both Amazon and Newegg, but it’s on backorder on both sites at the time of writing this review. It looks like the demand is pretty high for this machine. This might seem like a pretty steep price for some, but it’s actually fair for the amount of tech that you get for it. The GTX 1080 is certainly the biggest factor, but when you add in the 120Hz screen and all the R&D going into making that chassis, it’s pretty understandable as to why it costs this much. Heck, after seeing the $4000 Razer Blade Pro, this thing seems to be a bargain. There really isn’t a whole lot of competition against the Zephyrus just yet, though. There aren’t even any thin 15-inch laptops with a 1070 in them, let alone the 1080. 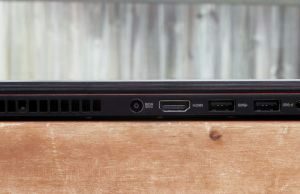 So that pretty much puts this laptop at the top of many peoples’ lists when it comes to looking for powerful ultrabooks. But if for whatever reason the Zephyrus isn’t for you, also keep an eye out for the Acer Predator Triton, which will carry the Max-Q GTX 1080 as well. If you don’t mind a little extra thickness, the Aorus x5 MD is a more traditional looking laptop that has the same specs as well, only with an overclockable CPU. Finally, if the price is too high and you don’t mind a GTX 1070, keep a close eye out for the updated MSI GS73VR. There’s a lot to like about this laptop, that’s for sure. It’s certainly a nice to see thin and light 15-inch laptop with a GTX 1080 in it. Overall, I’ll give the Asus Zephyrus a good grade because I think it has good value, decent build quality and some pretty good specs. Not only does it have a lot of horsepower, it also offers a very thin form factor that allows you to carry it anywhere with ease. On top of that, the 120Hz IPS screen is certainly a nice highlight to pair with the GPU. I think those factors alone make up for the shortcomings of the laptop. But those shortcomings might prevent some of you from taking the plunge. The keyboard being on the edge, for example, might be too difficult for some to deal with. The mini trackpad might also be an issue. 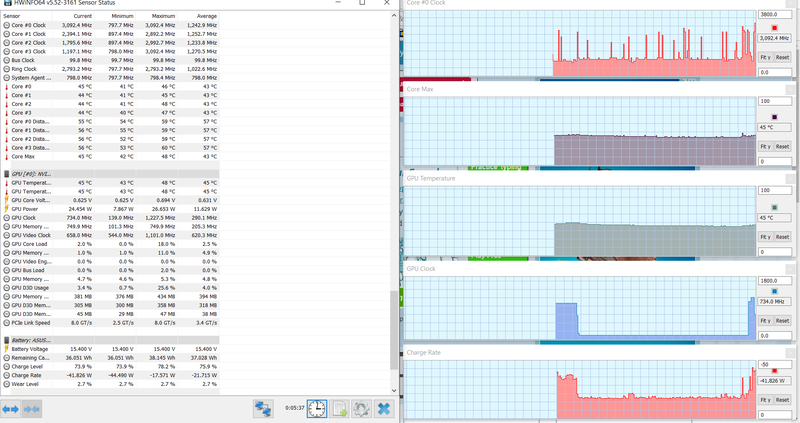 Still, I think the main problem with the laptop is the battery life though. 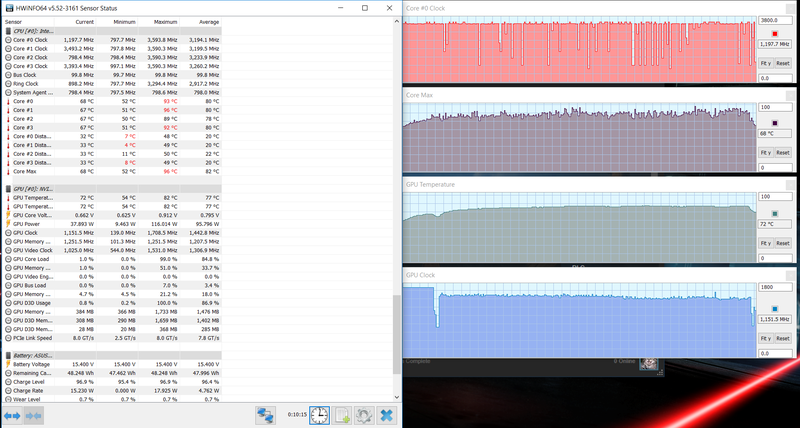 Less than 2 hours of battery life is not so bad for a pure gaming laptop, but considering many will want to use this in place of an ultrabook, it’s pretty unacceptable if you ask me. You can’t reliably go anywhere without the power cord, so that’s a problem for me. 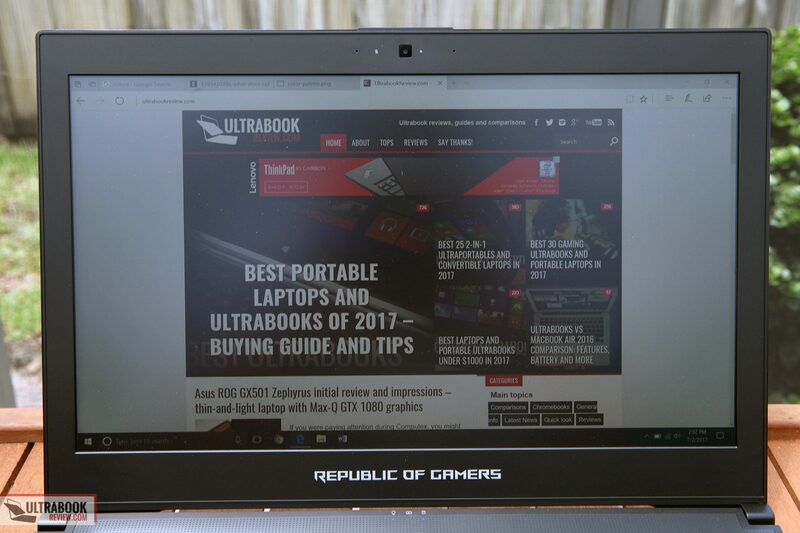 That’s all I have to say about the ROG GX701VI Zephyrus though, and hopefully, this article helps you make a more informed decision. I’ll have this unit for a while, so if you have any questions, please feel free to ask in the comments section below. Max-Q certification is supposed to have a 40dB ceiling. Can you talk more about your 50dB readings? 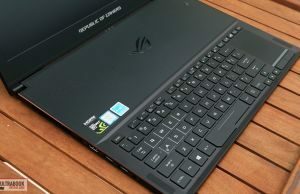 Would you say it's noticeably much quieter in general than other 1070- or 1080-style laptops? I'm pretty sure their spec is at ear level. I can't imagine the limit being 40dB at the fan exhaust. My readings in the back we're pretty close to the fans – not somewhere you'll normally be. 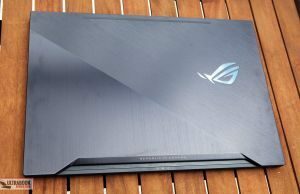 In your opinion, excluding the ridiculous price that razer choosed for its laptop, which one is better between the asus zephyrus and the razer blade pro? Tough call. 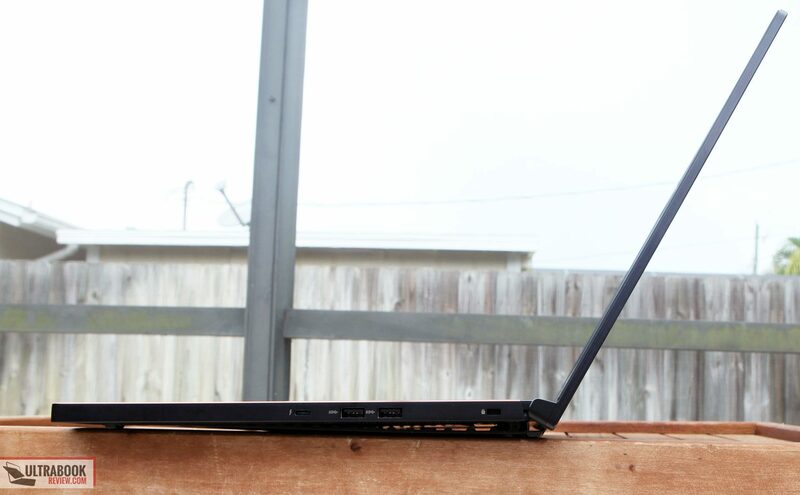 If you can get over the keyboard and the price, the RBP is a pretty decent laptop. I could not get used to that keyboard, though, no matter how hard I tried. I'm very much accustomed to the Asus keyboard now. I think I'd probably pick the GX501. 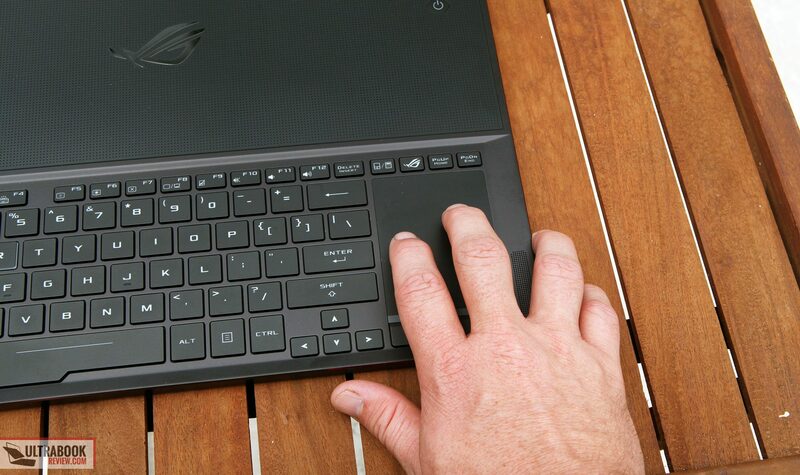 Realistically, the only thing the RBP has over the Asus is the trackpad. Maybe the build quality as well, but the RBP is significantly thicker and heavier. That 120 hz FHD screen is much more suitable for gaming than the 4k screen. 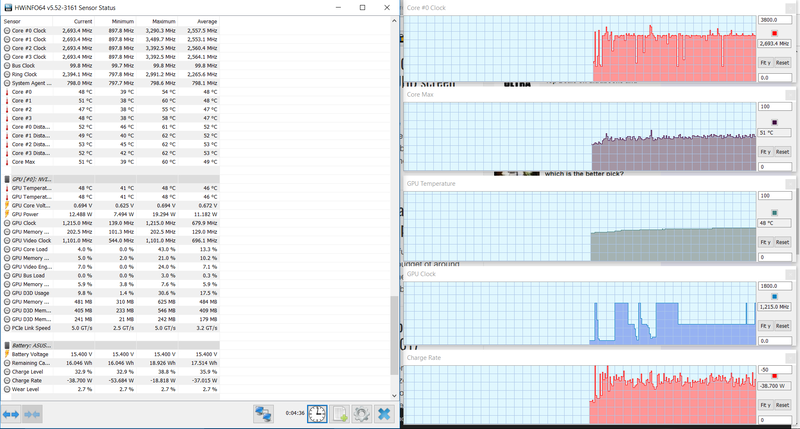 I'd also rather not deal with the CPU throttling on the RBP. The keyboard up front make perfect sense, I don't need to lean forward to game and have my palm being fried like on a frying pan while under load. The keyboard at the edge feels like desktop keyboard pretty much and desktop keyboard some do have built in wrist rest or some needs to buy a gel wrist pad. Keyboard design is win win, notebook not really meant to sit on your lap. It works but it's hard to hold your laptop in place without flipping it over. Great review as always. 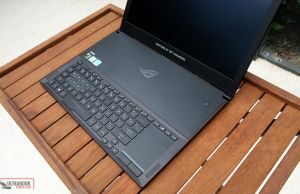 What would you go for out of the Asus Zephrus, Razer Blade Pro and Aorus X7DT v7 QHD? And why? Funny you should ask – I was just talking about this with someone, yesterday. First, let's just take the RBP out of the equation, as it has the same heft of the Aorus X7 DT and worse performance than the Zephyrus. On top of that, it's much too expensive, possibly has Gsync issues and also is thermally challenged. The other two choices are different animals and it'll all come down to whether or not you value portability over a little better performance and more hard disk space. Both screens are 120hz and have about the same pixel densities. 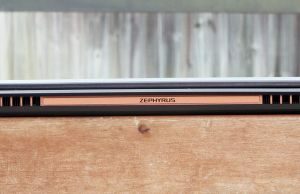 The Zephyrus screen has a slight edge being IPS. Both keyboards and trackpads are good. 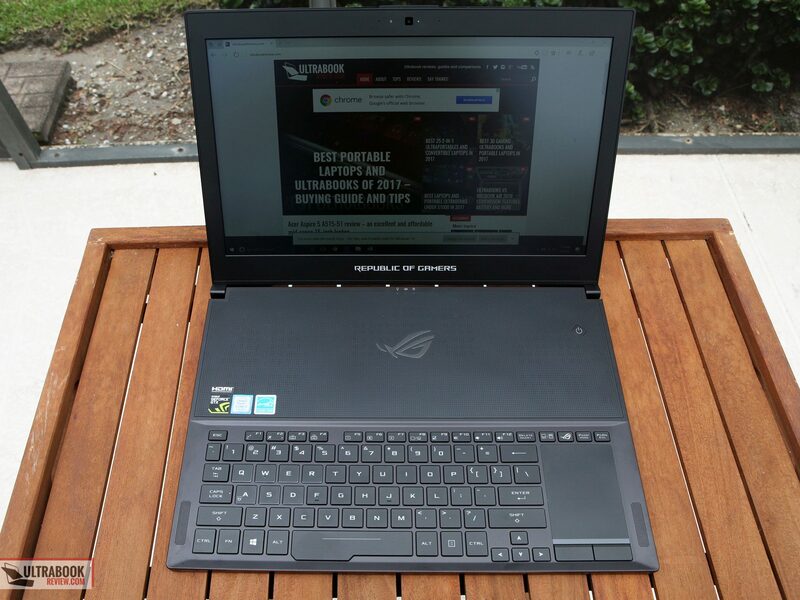 The Aorus outperforms the Zephyrus, for sure, but it's a lot larger – the main trade-off. But the Aorus has 2x m.2 SSD slots and a 2.5" slot, while the Zephyrus only has a single m.2. the Aorus also has a battery nearly twice the size and can handle over double the RAM. To answer your question now, do I think the Zephyrus is the better machine? In many ways, yes. But could I live with it? For me – no. In my case I'm actually sticking with the Aorus X7 DT and it's mainly because I have a 2 TB 2.5" SSD, 32gb of RAM and a 1 TB m.2 SSD that would go to waste if I stuck with the Zephyrus. If I didn't need all that though, I'd probably stick with the Zephyrus. Really helpful. So you prefer the Zeprhus screen even though it's 1080p vs QHD on the X7 DT? Well because it's FHD, games will play the same or even better, even though the GPU is throttled. It's also IPS, so the viewing angles and contrast are better. Even though the resolution is higher, the Aorus display is still a larger display, so the pixel density is only 26ppi higher than the FHD display. Depending on how close you are, you might not be able to tell the difference in sharpness. There's minor trade-offs to both but I consider both screens to be excellent and could live with either. Literally, the only thing I don't care for on the Aorus is when looking at it from above when it's on a desk. The vertical viewing angles are just not as good as an IPS screen. My sound meter says they both are nearly the same, but it didn't take into account the time and how annoying the fans are. I found the Aorus to be ok but I much prefer the Zephyrus, as the fan noise is directed downward and away from the user. Any sound created is very dampened. 2TB PCIe drives are expensive – there's not much way around it. If you can source the drive and ram and do it yourself, I'd say go that route. If it were me, I'd definitely be updating it myself over paying that much for more storage. It's a pretty involved teardown though, and not very straightforward, so I can see paying the extra to have someone else do it. Is it worth it? For me, I would do it if I had no other choice. But everyone is different and most could probably live with 512GB and deal with external storage. Don't forget that TB3 port can support an external drive as well. Hi Derek do you have an ETA on the X7 DT review. It's done. Andrei is editing it and should have it up today. i would like to know about the moving plate.. does it get dust when you use zephyrus for a long time? Long term, I'm not sure the extent of it. I didn't use it long enough to find out. 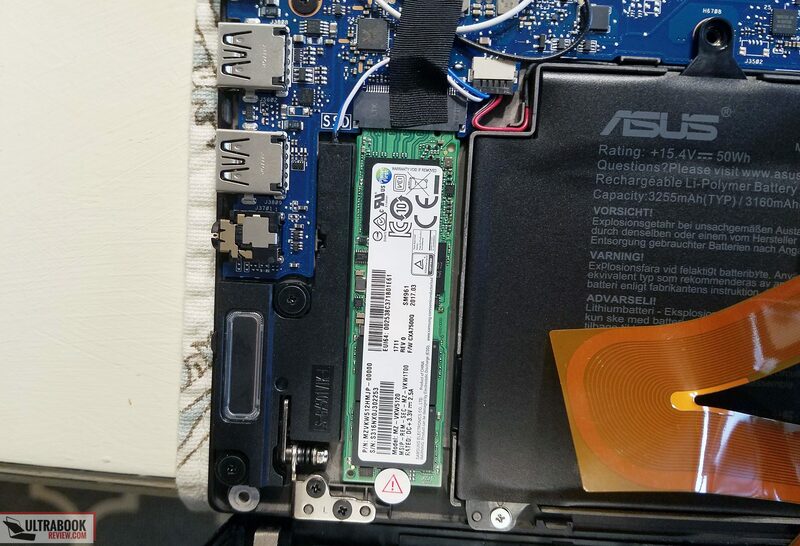 I think it's safe to assume it collects dust though, otherwise Asus wouldn't have included a phillips screwdriver to take the bottom cover off. They actually include maintenance directions on how to properly clean it. Hi Derek, fantastic review. I was looking for something as indepth as this. I have a couple of questions which I'd greatly appreciate your answer to. 1.) 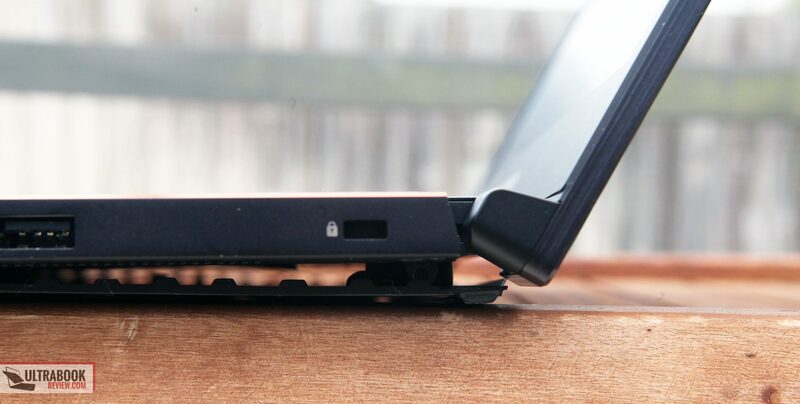 How durable did this laptop feel to you? 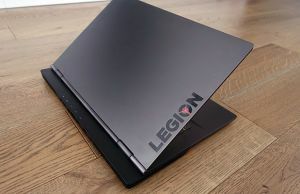 If I were to purchase it, I would want a minimum of 3 years of function, do you think the build quality, thermals and such would give me this? 2.) The competitor to the Zephyrus seems to be the Asus Triton 700, to my knowledge they seem to have the exact same, if not similar specs. What is your opinion on the Asus Triton 700 over the Zephyrus? Which one seems like a better investment? With the exception of the bottom panel, the laptop is pretty well built and durable. Could easily last 3 years. But that bottom panel is the wild card. It's a little flimsy and it's a mechanical moving part, so there's no telling if and when it'll break. As much as I got my power cord caught in it, I could certainly see something snagging an edge and potentially harming the cover. The good news is that even without the cover, the laptop will still work. You'd either have to replace it or put some new rubber feet on the bottom though. As for the Acer, I have no opinion on it. It's still not released, so there's no telling how well it compares to the Asus. I just purchased one, after reading your review, as well as many others. Quiet gaming is my top priority. I don't have to have the fastest equipment, but I do need the quietest. Having a machine designed for top gaming performance makes for a lot of leeway in throttling back. I'm actually able to run my older game titles with all the FPS I need and no fan noise at all. That said, I have one big glaring issue: Accent lights. Just like you said in your review, they won't turn off. I've been scouring the web for any indication of a way to disable them and not one clue. 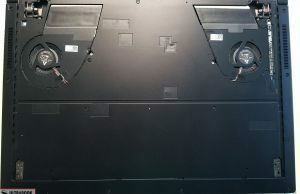 I can see no other option but putting tape over the lights (gasp). If you have Asus contacts, I'd be interested to hear their plans for those lights. Is it possible to access them via software, or are they 100% hard wired in to the power cord charging? I don't personally have a contact but I think Andrei does. Maybe he can ask. I really doubt it'll help though. It's most likely something that's built into the charging circuit. Totally dumb if you ask me but this isn't the first time Asus had done something like that. One of my first Zenbooks had a similar feature with the charging cable that I ended up putting tape over. 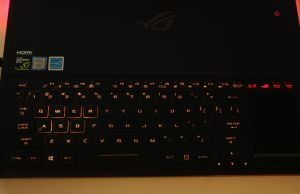 I haven't touched the Zephyrus, but with most Asus laptops there has never been an option to control the lights through software, so I'd reckon most of them are hard-wired, while the logos on the lid are usually lit by the screen's panel. In this latter case there should be a way to go inside and place something between the panel and the outer shell to block the light. 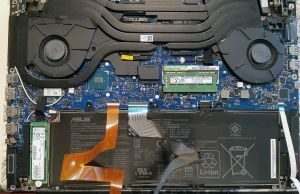 With the others, if you're very technical you could open the laptops, find the LEDs and somehow disconnect them, but you'd void warranty and really have to know what you're doing there. Other than that, I'd reckon your best bet are some sort of decals. For some reason Asus considers these lights a feature, a selling factor. Perhaps some people appreciate them, otherwise OEMs wouldn't keep putting them on so many laptops. So how do you make a screenshot if it doesnt have the printscreen button?, its driving mad, is there another way? Really awesome thank you for the undervolt. I did -0.100v on the CPU, I dropped from 96c to 88c average CPU package temperature. It's more sustainable without throttle and for the long run. I don't understand why Intel set the 7700HQ so high voltage. They only set it that way because not all 7700HQ CPUs are equal. While most can be undervolted .1V, there's probably 1% that will crash and that is unacceptable in Intel's eyes. They all need to work so they pick a standard voltage that will work for all CPUs. And then they leave it to the user to fine tune it if necessary, hence their software being called a tuning utility. Glad it's working better for you though. Thanks for this review. I also found you talked about external batteries on other sites but haven't seen your full resolution. will you mind telling me more about it? I remember discussing them on the forums but I never actually got one. As long as the connector and voltage are the same, I don't see why it wouldn't work. I doubt it'll work for gaming though – the power draw is generally too high for batteries of that size. Great review. Have you tested this with the Razer Core, and if so can you give any thoughts on how well it works? Does it require a lot of tinkering, and is it stable? Thanks! I have not. I'm not sure what you would gain from using the Core though. 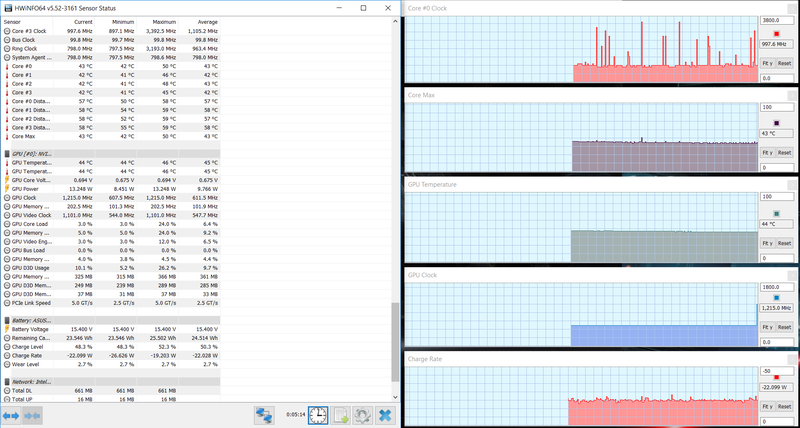 The performance drop I detected with the Core is about the same drop you see with a Max-Q version of the 1080. Unless you but the 1070 version of the Zephyrus, there's really no point in having the Core. is this good for video editing and 3d modeling ? 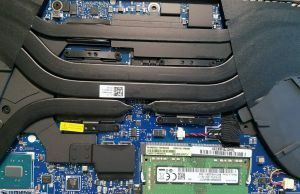 is it better and faster than MBP 2017 ? as I Will never use it for gaming . Yes, it's fine for both. Couldn't tell you if it's better though. I've never 3D modeled on a MBP, as most 3d software that is worth using is windows only. If you get a 15" MBP with dedicated graphics and load windows on it, the MBP might perform a little better if you get the i7_7920HQ version. But it will cost you a lot. I'm not sure I would recommend this machine over any normal laptop if you aren't gaming though. A GTX 1080 is way overkill for both video editing and 3D modeling so the drawbacks of the weird keyboard/trackpad placement and bad battery life make it less worthwhile. An XPS 15 would be a far better choice in my opinion. You had already time to test if the notbook is charing via usb C ? I did and I'm sorry I didn't get to reply back sooner. Unfortunately, it's not a charging circuit though. I tried a 15v charger and even a variable voltage (up to 15v) charger and neither worked. It's pretty much what I expected though – I have yet to see a laptop with a high end dedicated GPU that can charge via usb-c. There most certainly are some power limits involved. Hi Derek, Thanks for replay .. so means you not tested with more than 15V so means then less than 30Watts ? i have already a powerbank that can deliver 45 watts (search on amazon for imuto) and there are also a lot of charger that bring already 65 watts and somethmes more… it makes sense that ther is a limittation but the limitation from usb type c itself 100 watts. so it should be in the end possible to charge in idle. Will it possible for you to try this out ? It's not the wattage that matters, it's the voltage. It has to match the battery or it won't charge. There are exceptions but they have to have the proper circuitry for it to work. Up until now I've never had a charger more than 15v. I did just see a 20v one on Amazon for a decent price, so I'll try that one out. Considering the laptop didn't even recognize my other one as a charger at all though(no warning of insufficient charge or anything), my best guess is there's no charging circuit. that is true but i guess you not using a 15v charger with more than 3Amps so thats why…. it can be possible about that there is no charging circuit but i know from my Razer blade stealth he is also not recognizing anyhting first if you give him nearly the same what the original charger is delivering… thanks for help and let us know if you try the 20v charger. I recently bought one. 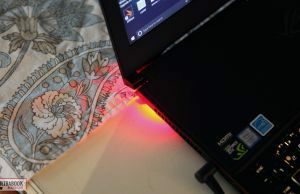 And I found out there's a gap between the screen and the bottom bezel(where the rog logo is located). The gap is not huge but noticeable. I can even insert several pieces of paper in it. Do you think it is normal or you suggest me to exchange? Besides the gap, there are no other issues for now. Yup, I have a similar gap. Surprised I never noticed it before. Thanks – now I'll probably notice it every day now. :) It's probably not worth returning since the next one will probably have the same issue. Usually they put double sided adhesive behind the bezel, but I guess they opted not to on this model. It probably created too much backlight bleed. 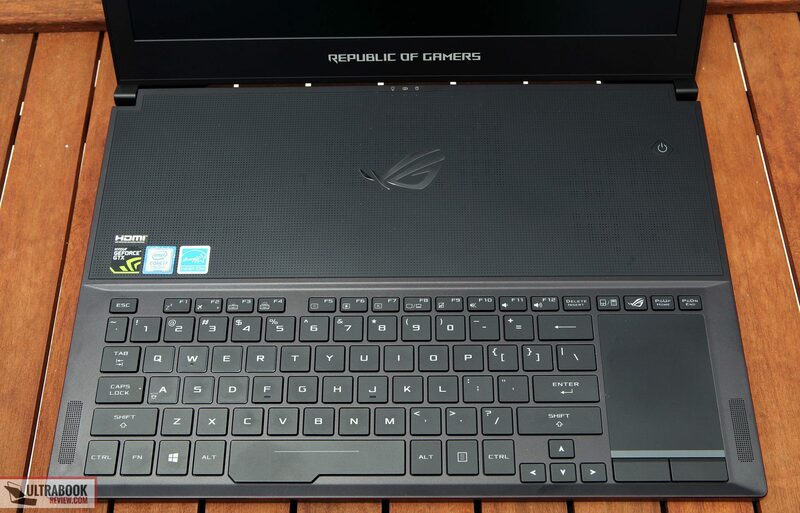 What are your thoughts if you had to choose either the ROG Zephyrus or the Triton 700? 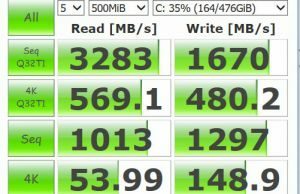 Both have similar hardware with the triton being slightly superior with raid 0 SSD over the zephyrus. 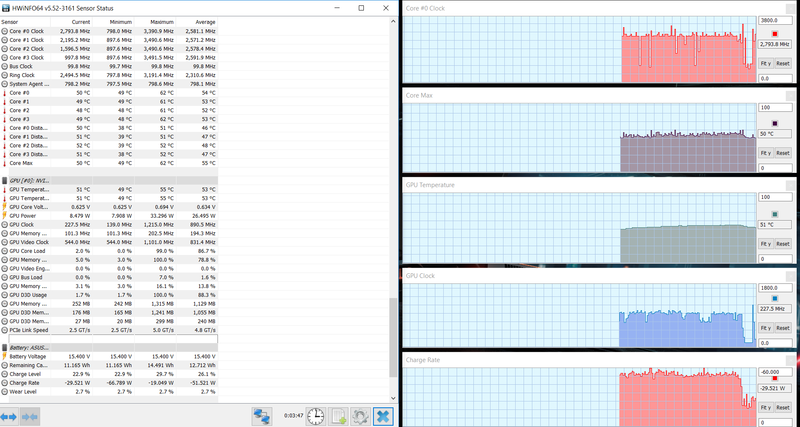 The RAM 32 GB vs the 24 GB are quite a difference but when tested, it only leave a slight performance difference. I really dislike the whole idea of having that glass trackpad with no clear right click, so asus wins the trackpad area for me. but the triton 700 have brighter screen and better speaker comparing to zephyrus (ive also read some cases where the speaker on the zephyrus broke due to maxing the volume over time when watching movie). Tough call. You're right, the speakers on the Zephyrus are crap in comparison. I've also read that there's a hardware defect inside the casing that makes them rattle. And even another hardware defect with the trackpad that makes it unresponsive at times. If money were no object, I'd go with the Acer. Dual M.2 slots, more ram and a mechanical keyboard pretty good advantages. I didn't care for the trackpad at all, but it's something you can get used to. The screens are actually the same model on the high end models, so one being brighter than the other is just a subjective comparison. It's a bit late to comment on this device but I'll ask about swapping it. if you had the choice of this zephyrus i78750h with gtx 1080max q vs scar2 with rtx2060 with the same price, which would you choose, i like the zephyrus because of the thunderbolt3 future proofing and normal placement of webcam. the Scar 2 has RTX 2060 with 144hz 3ms display but no thunderbolt and terrible placement of webcam. which one would you choose value wise if they were both the same price. If you can deal with the thickness, I'd choose the Scar 2. There are too many sacrifices with the zephyrus to be made that make it harder to tolerate. Unless you absolutely need thunderbolt 3 for something, it's easy to work around. Thunderbolt three is vital for future proofing tho right? The possibility of having any exteral graphic card is awesome. 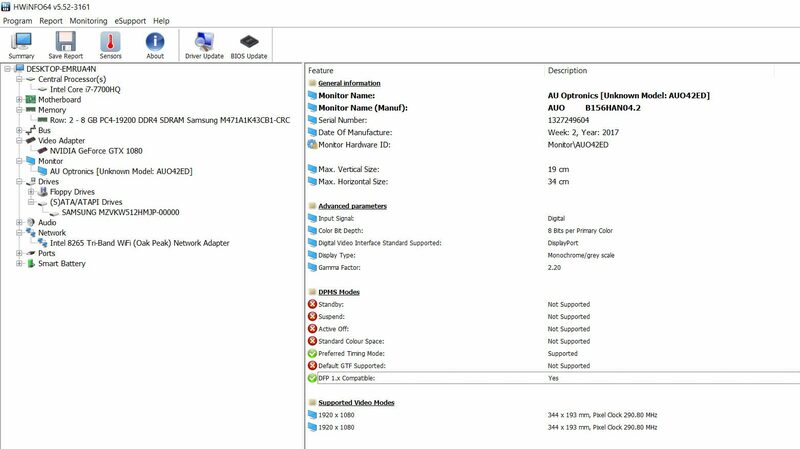 +512nvme + (is there any expansion slot here)? I guess i just want the zephyrus cuz of future proofing but scar have more storage? My opinion is storage, ram upgrade and CPU speed is more future proof than updating a gourmet through an external GPU. That's just me though. I know that it's doubtful that I'll ever go the external GPU route again. so they both have same CPU of i7 8750 and the scar only have a 2060 the zephyrus have a 1080 maxq. isnt the 1080 maxq a much better performer than the 2060? but i do see your point on the storage especially… ugh im still torn between the giving up the gpu diffrence for storage expansion. Yeah the 1080 is a better performer for sure. If that's really important to you, then there's no question.